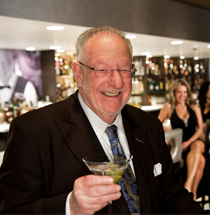 Named after former Las Vegas Mayor and mob attorney Oscar Goodman, Oscar’s is a glamorous and uniquely Las Vegas Steakhouse overlooking the lights of Fremont Street. Located inside the Plaza’s of the iconic glass dome, Oscar’s pays homage to the Vegas of yesteryear and has become a must-visit, only-in-Vegas dining destination thanks to its classic ambiance, memorabilia displays, handcrafted cocktails, including the former mayor’s signature martini, and a delicious menu of perfectly aged steaks, fresh seafood and made from scratch sides. Carrying over Goodman’s reputation as the “Happiest Mayor in the Universe,” Oscar’s affectionately boasts itself as “The Happiest Steakhouse in the Universe.” The approach to food and service at Oscar’s is the same as Goodman’s approach to life – eat, drink and have fun! In honor of National Prime Rib Day, we are offering an exclusive three-course menu for $68 per person. Make this Mother’s Day a memorable one by dining with us at Oscar’s Steakhouse. Make this Father’s Day a memorable one by dining with us at Oscar’s Steakhouse. Sunday – Thursday from 4-7pm, 50% off appetizers, house wine, well liquors and beer. Oscar’s Beef, Booze and Broads is a marriage of old-school Vegas and contemporary charm…A visit to Oscar’s can be like a stroll down memory lane, to a Vegas where mobsters and casino moguls ruled. It’s a throwback, yes, to old Las Vegas, but the chef is smart enough to honor tradition without being a slave to it. 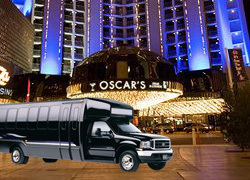 The theme of Oscar’s is pure ‘Rat Pack’– beef, booze and broads…There’s a swagger at Oscar’s and the experience is all about fun. I brought my clients over to the lounge at Oscars for drinks and appetizers to and let me say that my clients enjoyed the atmosphere and general climate of the restaurant, my Kudos to Oscar for bringing more class to Downtown Las Vegas. Best Steakhouse in Las Vegas for 2017. It is a glamorous and uniquely Las Vegas steakhouse overlooking the lights of Fremont Street. My husband took me here for our 25th wedding anniversary, the atmosphere as so fun and romantic. That being said the servers were amazingly attentive and really made us feel right at home. We hope to be back on a regular basis. The happiest Mayor on earth created a classy fun place to dine in mobster style…The Birdseye view of Fremont Street after dark is the pinnacle.